1 of 3 Combine butter and 3/4 cup water in medium-size microwavable bowl. Microwave for 1 minute. Add stuffing mix and cover bowl, venting one side. Microwave an additional 1 1/2 minutes. Stir with fork. 2 of 3 In large bowl, combine celery, tomatoes and ground chicken. Stir until blended. Add stuffing and salt. Stir to combine. 3 of 3 Divide stuffing evenly among peppers. 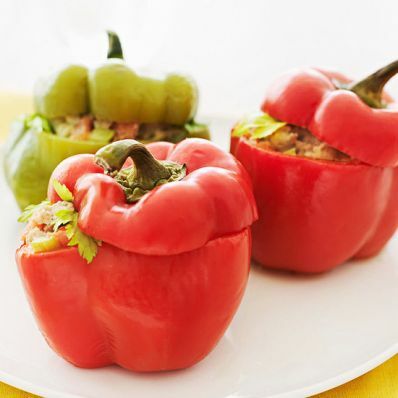 Replace pepper tops, fit into slow cooker (see Note) and add 1 cup hot water. Cover and slow cook for 6 hours on LOW. Remove with tongs and serve.